Rajput swordsmen carry the double edged scimitar (known as the Khanda) into battle. Rarely are upper class men forced or even willing to join a basic swordsmen unit, but this is the exception. These soldiers slash with their exceptionally sharp swords to wreak havoc in the ranks of lesser armed spearmen. They can also hold their ground against other heavily armed and armored foes. 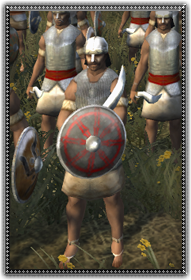 Quality levy infantry is rarely recruited so wise rulers will take advantage of the access to good soldiers.